Now that we’ve reached our goal weight and exercise regularly, DH and I have added some treats back into our diet. It has been fun getting back into the kitchen, and one of the things I’ve wanted to explore is bread baking. I feel like sometimes the recipes just don’t turn out right and I’m not sure if it’s me or the recipe. 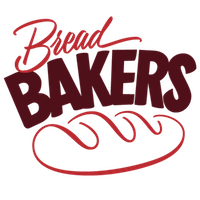 So I’ve decided to join Bread Bakers, a group that has a monthly theme. 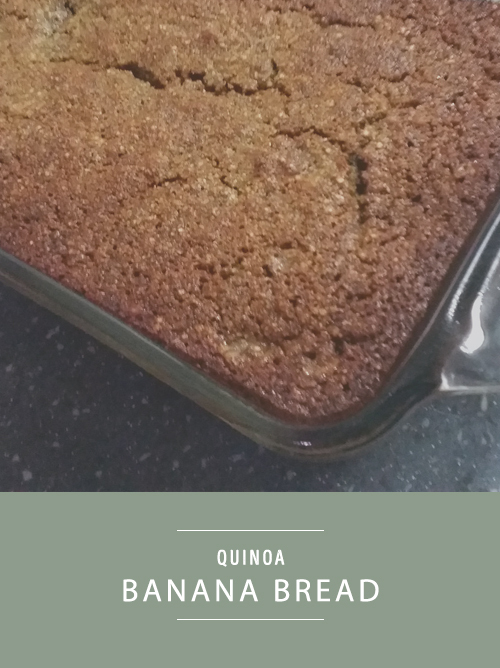 This month’s theme was Ancient Grains, and I looked through my cookbooks and stumbled upon Quinoa Banana Bread. This can be made gluten-free. I searched high and low for quinoa flour, and only after trying at three different stores did it dawn on me to make my own. Duh. So I simply took some uncooked quinoa and ran it through my spice grinder. The recipe calls for melted virgin coconut oil, but I substituted olive oil. I tried a new way of cooking quinoa that worked great. It’s called the pasta method. Basically you cook it as if it were pasta–fill a pot halfway with water, bring to a boil, add quinoa, and cook for 10-13 minutes. Then strain it and let set for a few minutes. Fluff with a fork. The recipe suggested adding 2/3 cup of chocolate chips, but I was feeling healthy and added 2/3 cup of chopped walnuts instead. In a large bowl, whisk together quinoa flour, flax seeds, baking soda, cinnamon, and salt. In a medium bowl, whisk eggs until blended. Stir in sugar, bananas, coconut oil and vanilla until well blended. Add the egg mixture to the flour mixture and stir until just blended. Gently fold in quinoa. Bake in preheated oven for 55 to 60 minutes or until top is golden brown and a tester inserted in the center comes out clean. Let cool in pan on a wire rack for 10 minutes, then transfer to the rack to cool completely. The Verdict: DH and I LOVED this! The texture and flavor were excellent. It made a quick breakfast, and I felt good about getting in some protein from the quinoa. More great ancient grains bread recipes! Good for you for grinding your own flour! I love quinoa, I love banana, I love bread so I can’t imagine why I wouldn’t love this. Thanks for sharing! It sounds impressive but was so easy. I can’t believe I didn’t think of it sooner! would never have thought of making a quick bread using only quinoa. Looks nice. Me either, this has been a fun challenge! First I want to congratulate you and your husband for reaching your goal weight and working out. It is a long hard process and you should be very proud. This bread is a great way to treat yourself and still remain healthy. Congratulations on reaching your goal! I think the fiber in these grains are definitely much better than the ap flour, and I am loving the flavors as well. This bread looks delicious and I am sure it was a delicious treat. Absolutely! The flavor was amazing. Wow, very impressive….I love your blog, you have really accomplished so much. Love this recipe too, love that it has quinoa in it. Take care! Quick bread with quinoa and quinoa flour — wow, that sounds just amazing. It looks awesome too. I never would have thought about cooking with quinoa flour! so many healthy breads this month with the ancient grains theme – and I love banana bread in any form!